The often terrifying ordeal of meeting the in-laws-to-be made for great comedy in Meet the Parents. Now that 2000 movie’s co-writer, John Hamburg, is covering similar ground in the director’s chair of this year’s Why Him?, though with the Meet the Parents dynamic “turned on its head,” as he told us. 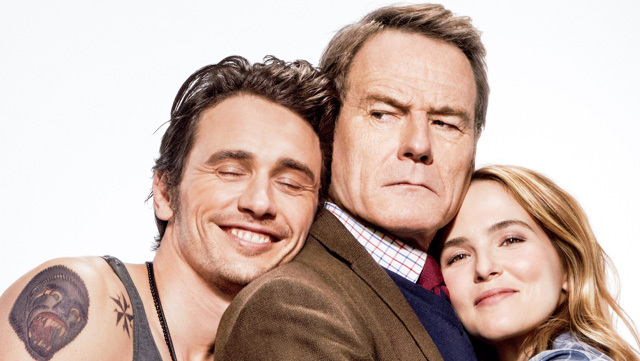 In Why Him?, Ned (Bryan Cranston) and Barb (Megan Mullally) fly across the country at Christmastime to meet their daughter’s Silicon Valley multi-millionaire boyfriend, Laird, played by James Franco. Cranston’s straight-laced family man immediately clashes with the vulgar, impulsive Laird. Why Him?’s cast also features Keegan-Michael Key (Keanu) as Laird’s estate manager, Griffin Gluck (Middle School: The Worst Years of My Life) as Ned and Barb’s son, Zoey Deutch (Everybody Wants Some) as the daughter, and Cedric the Entertainer (The Steve Harvey Show) as Ned’s friend. The movie is produced by Shawn Levy (Night at the Museum). Also showing up in the movie much to the delight of KISS fanatics Ned and Barb: Gene Simmons and Paul Stanley. Watch the CS video interview below for the Why Him? cast members’ tales of how the pair of rockstars defied their expectations on set, plus hear about the outing Deutch organized with Cranston for some screen father-daughter bonding, and get Cranston’s and Franco’s advice for your own meet the parents moment. 20th Century Fox will release Why Him? in theaters on Friday, December 23.